A small vertical-takeoff-and-landing rocket being used to test advanced technologies veered off course an instant after liftoff from the Kennedy Space Center Thursday, crashed and exploded in a spectacular burst of fire and smoke. There were no injuries or other property damage, officials said. The Morpheus rocket was designed and built by engineers at NASA's Johnson Space Center in Houston to test advanced technologies and approaches to integrated propulsion and guidance, navigation and control that could be used in the future for cargo missions to the moon. The rocket's engine burns liquid oxygen and methane, a propellant that can be easily stored in space. The Morpheus rocket has been test fired while attached to a crane, but engineers were staging its first untethered free flight Thursday near the Kennedy Space Center's shuttle runway. 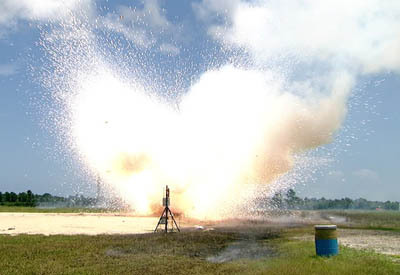 The rocket's engine appeared to ignite normally and the vehicle climbed vertically for just an instant before tipping over and crashing on its side. A few moments later, as the wreckage burned, a secondary explosion erupted, presumably the result of a ruptured tank. "During today's free-flight test at Kennedy Space Center, the Project Morpheus vehicle lifted off the ground and then experienced a hardware component failure, which prevented it from maintaining stable flight," NASA said in a brief statement. "No one was injured and the resulting fire was extinguished by Kennedy fire personnel. "Engineers are looking into the test data and the agency will release information as it comes available. 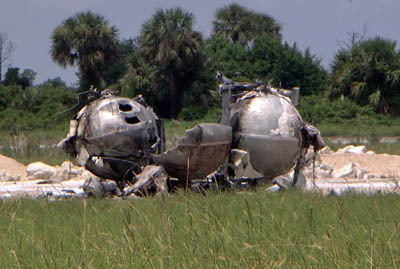 Failures such as these were anticipated prior to the test, and are part of the development process for any complex spaceflight hardware. What we learn from these tests will help us build the best possible system in the future." On its web page, Morpheus engineers described the rocket as a demonstration test bed for "green propellant propulsion systems and autonomous landing and hazard detection technology. "It was manufactured and assembled at JSC and Armadillo Aerospace," the project said on its web page. 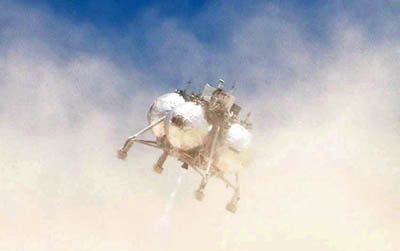 "Morpheus is large enough to carry 1,100 pounds of cargo to the moon -- for example, a humanoid robot, a small rover, or a small laboratory to convert moon dust into oxygen -- performing all propellant burns after the trans-lunar injection. "The primary focus of the test bed is to demonstrate an integrated propulsion and guidance, navigation and control system that can fly a lunar descent profile to exercise the Autonomous Landing and Hazard Avoidance Technology safe landing sensors and closed-loop flight control. Additional objectives include technology demonstrations -- for instance, tank material and manufacture, reaction control thrusters, main engine performance improvements, helium pressurization systems, ground operations, flight operations, range safety, software and avionics architecture."